I was raised Italian American and one of my favorite dishes besides pasta, lasagna, and pizza is Polenta! 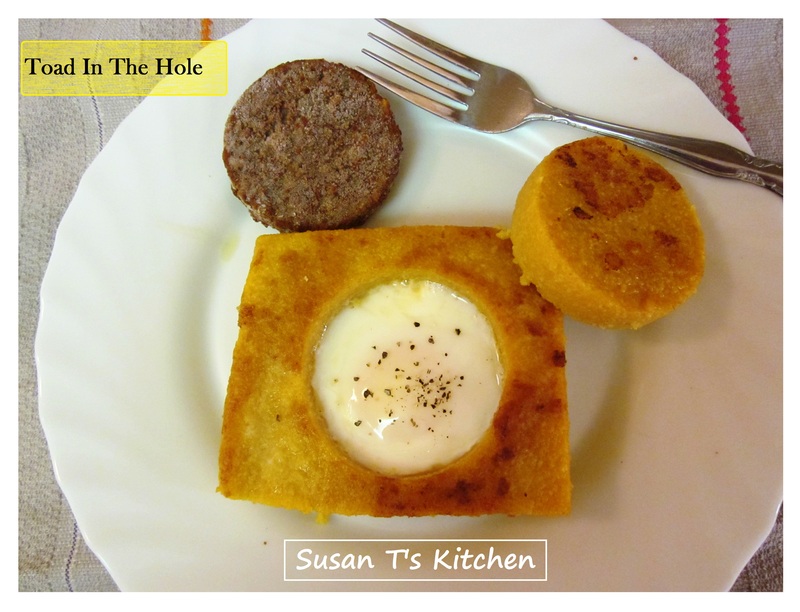 Here is one of my favorite Polenta Dishes called Toad In The Hole made with eggs and vegetarian sausage. This is a great meal for breakfast or anytime! Questa sera faccio una polenta, vi aspetto tutti. Tonight I’m cooking polenta, I’ll be waiting for you. Over medium heat, bring 2 and 1/2 cups of broth to a boil in a large saucepan. In a small bowl whisk the cornmeal into remaining 1 and 1/2 cups of broth. Whisk the cornmeal mixture into the saucepan and return to a boil, whisking constantly. Continue until polenta is thick and creamy. Use a damp spoon or ladle to transfer polenta to a square baking dish. Add drizzle olive oil to the pan and set on medium heat, fry the squares and circles until golden on the bottom. 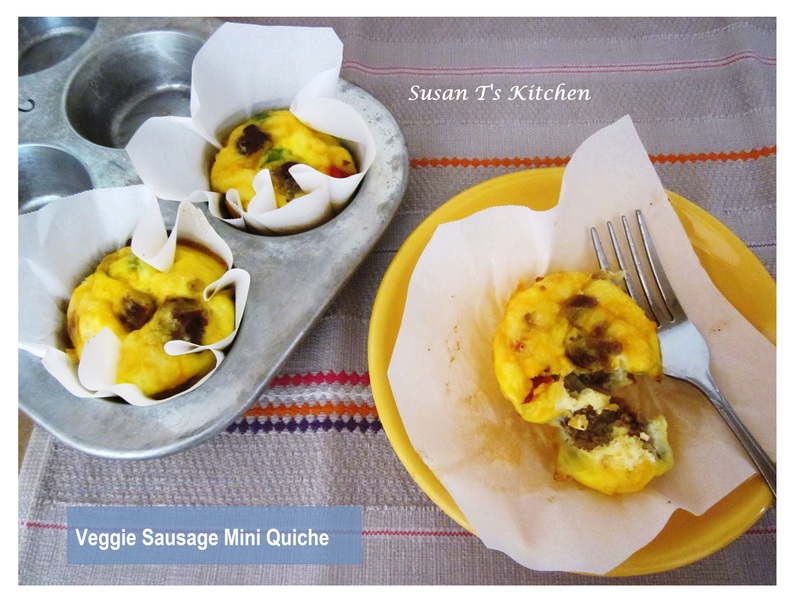 Flip and crack an egg into each hole, cover and cook until the whites are set, serve with veggie sausage. I Love take-out but not the price or the calories. Most of the time I can’t even find take-out with a meatless choice so I came up with my own by substituting a few items from a recipe I found at allrecipes.com My recipe can be made in as little as 30 minutes and you will even have leftovers for lunch! 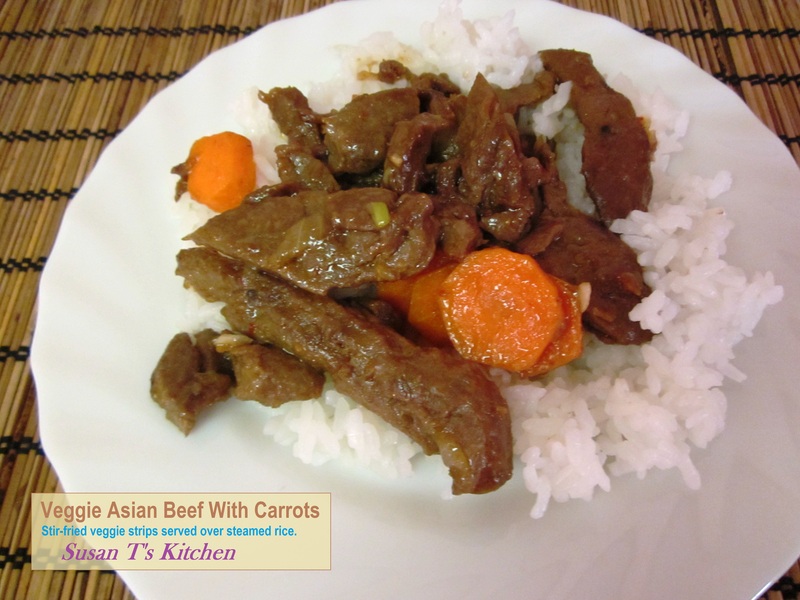 I like using a rice cooker because while the rice is cooking the I can concentrate on the beef strips. 2 or 3 carrots sliced. In a small bowl, combine the soy sauce, rice wine, brown sugar, and cornstarch, and set aside. Heat the oil in a wok or skillet over medium heat. Stir fry the garlic until golden, add the vegetarian Beef Strips and stir fry for 2 – 3 minutes. Add the carrots and stir fry for 2-3 more minutes. Add the soy sauce mixture and bring to a boil, stirring constantly. Lower the heat and simmer until the sauce thickens. Serve immediately over the steamed cooked rice. Refrigerate leftovers and eat within a few days. 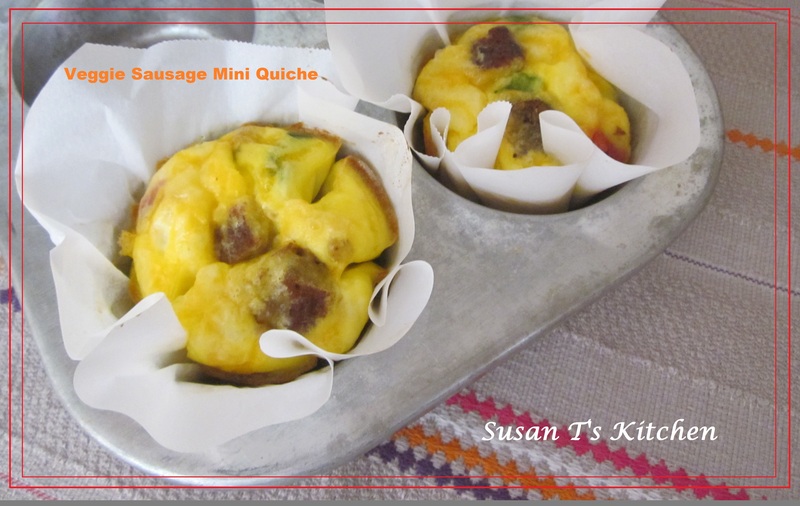 As I was flipping through a magazine I came upon a recipe for Jimmy Dean’s Hearty Mini Quiché! Jimmy Dean’s Ad said: ” TASTE SO BIG we had to make them small.” I liked that idea so much that I came up with my version using veggie sausage! They turned out wonderful! Beat eggs, milk and black pepper in large bowl with a wire whisk until well blended, stir in sausage mixture and cheese. Line cupcake pans with baking liners. Spoon mixture evenly into baking cups or parchment paper. for 18 to 25 minutes or until toothpick comes out clean by inserting into the center. Let stand for 5 minutes before serving. I love making this bread because it is so moist and delicious plus it is a great snack to take along in my lunchbox for those days whenI want something sweet. 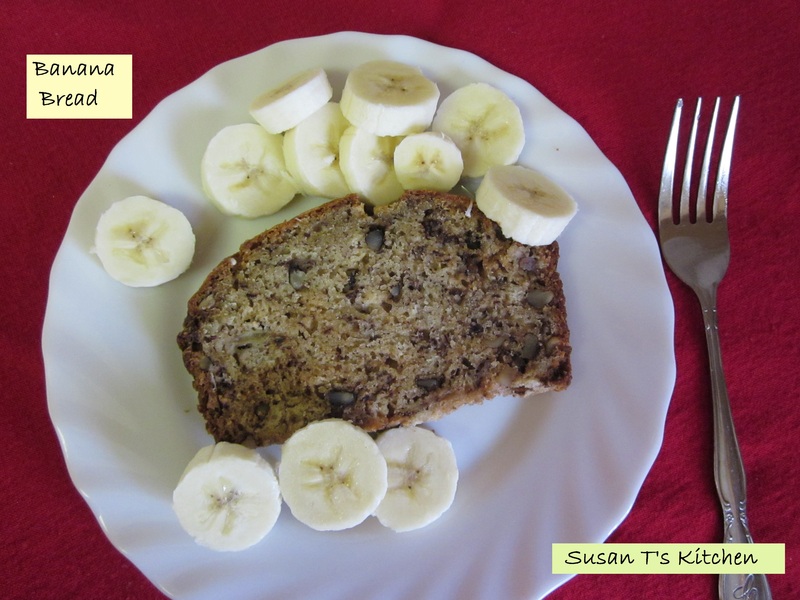 Add fresh fruit to the slice of banana bread to give it that extra yumminess. I use applesauce to replace the egg, soy milk to replace buttermik and vegan margarine to replace butter. You can add nuts or chocolate chips to the bread. This recipe can also be used to make muffins. 1 cup sugar in the raw . Mix sugar and margarine in a large bowl. Stir in applesauce, add bananas, soy milk and vanilla. Stir in flour, baking soda and salt. Mix in the chopped nuts. Pour batter into loaf pan and cover loosely with foil. Go ahead, lick the bowl, because no raw eggs were used! Bake for 30 minutes, remove foil and bake for another 20 minutes, if a toothpick comes out clean it is done. Cool completely and then slice to serve. Top with bananas or berries. Refrigerate and eat in the next couple of days, or freeze for later. When I was growing up potatoes were a staple in our house. My mother was so creative when it came to potato dishes and I have carried on the tradition. No doubt about it, I love potatoes, and potatoes are a staple in the pantry! 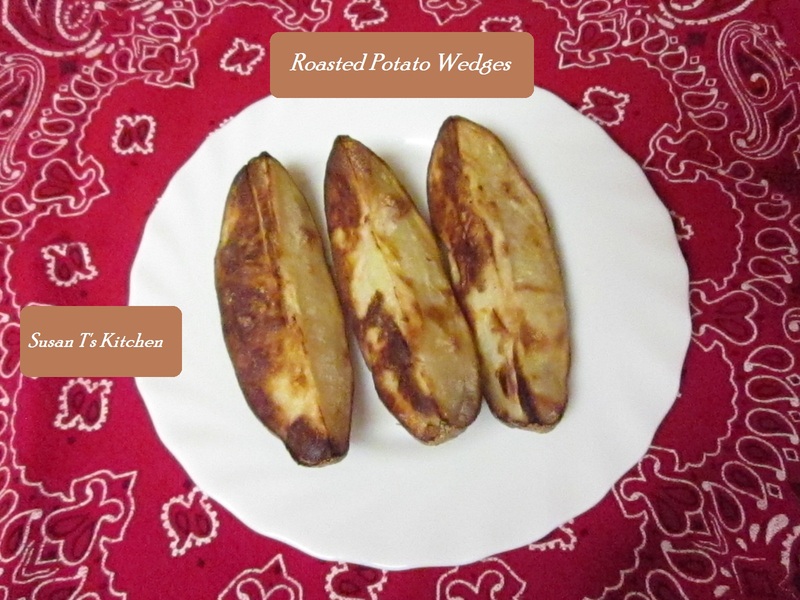 One of my favorite potato dishes is Roasted Potato Wedges because they are so simple, and can be enjoyed as a side to a main meal, or as a snack. Leftover’s are great for the lunch box as well, and the wedges are just as delicious cold or warmed up in the microwave! Remove from oven and serve with your favorite dipping sauce or eat them plain. I was born and raised in Hershey PA, Chocolate Town USA and I love chocolate! 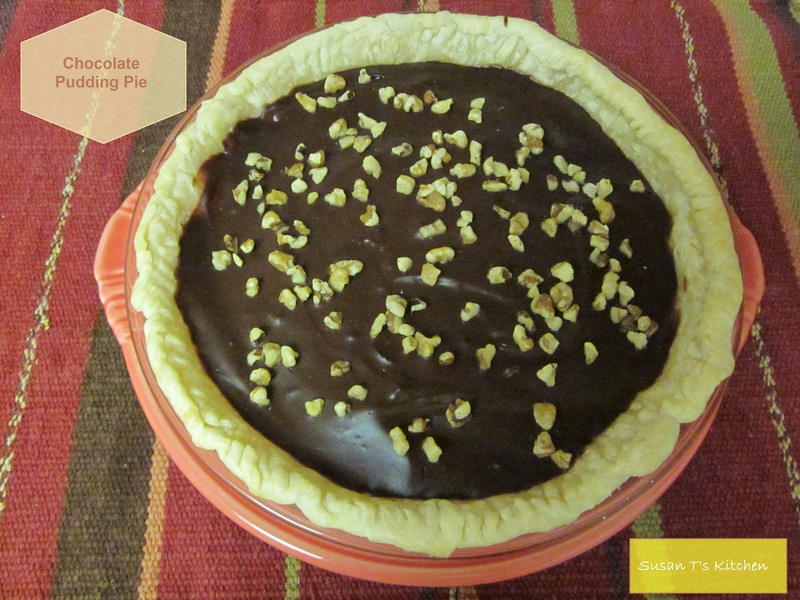 My mom would often make chocolate pudding pie for us kids when I was growing up, it was a special treat for us all! So I am going to spread some chocolate love by sharing my recipe for the Best-Ever Chocolate Pudding Pie! This pie has a filling that is dairy and egg free and made with Hershey’s cocoa. To make it extra special it is topped with walnuts! You can top the pie with anything you want such as peanuts, walnuts, banana’s and/or whipped cream! For the crust you will need one prepared pie shell to line your pie dish with. Cover and transfer to the refrigerator for several hours to chill. 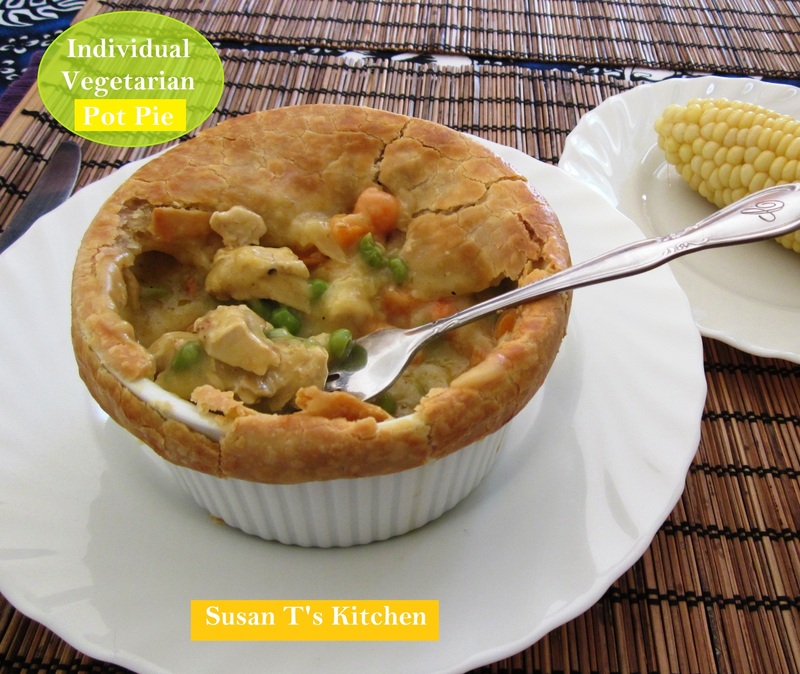 Growing up as a kid I loved my mom’s Chicken Pot Pie! But, as an adult I became vegetarian, and chicken is not served in the bungalow! However it is a food I can replicate using tofu. I was excited to make this in the kitchen and I do say it turned out quite good! This recipe makes 4 individual pot pies. Try it you might like it! If not use this recipe with chicken if you like! Heat oven to 400°F. Lightly coat 4 individual baking dishes (ramekins) with cooking spray. In saucepan, heat oil and cook potatoes, carrot, celery, onion and garlic over medium heat about 10 minutes, stirring occasionally, until vegetables are tender. Stir in broth, soy milk, water, parsley, tofu and peas. Heat to boiling stir in flour stirring constantly. Remove from heat and set aside. Place Ramekins on a cookie sheet. Divide mixture evenly among ramekins. Top each ramekin with a circle of pie dough. Bake 30 to 35 minutes or until pastry is puffed and golden brown. Cool 5 minutes before serving.